Warbirds News recently held a conversation with Sean O’Brien, Director of Operations for the B-17 Alliance Group. The organization, based in Aurora, Oregon is working to preserve the famous Gas Station Flying Fortress, B-17G 44-85790 known as “Lacey Lady”. This is the B-17 which has stood for many decades atop pylons over a gas station (now closed) in Milwaukie, Oregon. Obviously, in the harsh Oregon outdoor environment, the old bomber has suffered considerably over the many years of exposure. The B-17 Alliance Group is in the process of remedying this and has begun restoring the Fort back to airworthy condition. Warbirds News will be bringing readers regular status updates, and information on how to contribute. 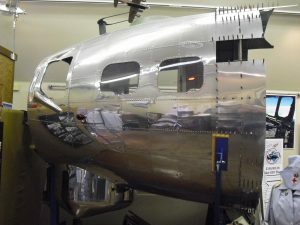 The fully restored nose section for “Lacey Lady” as she sits in the B-17 Alliance Group’s hangar in Aurora, Oregon. 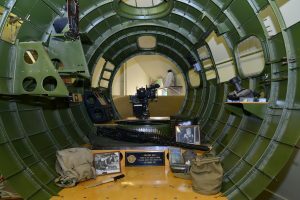 The B-17 Alliance Group formed back in the 1990s with the intention of not only preserving “Lacey Lady”, but the stories of the men and women surrounding the B-17 during the type’s service life. The organization removed Lacey Lady’s forward fuselage back in 1997, trucking it to nearby Aurora airport for restoration by Shane Wease. Unfortunately, funding ran out soon after the nose section was completed, so the project went on hold for a number of years. The team is now preparing to bring the rest of the bomber down from the pylons, and shelter the old girl in their hangar as the long rebuild process takes shape. Sean again, “In the summer of 2012 we removed the engines from the airplane to balance and lighten the airplane in preparation for bringing it down. Those engines are now in our hanger, and they are likely the lowest time 1820-97’s in existence with about 37 hrs since new. 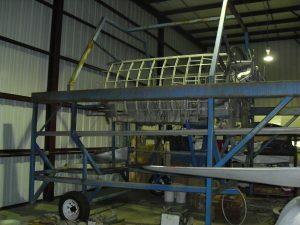 In the summer of 2013, we sent our cockpit roof to Atlanta Georgia along with our cheyenne tail turret where master craftsman Tom Wilson is rebuilding these components. Tom is also making us new skins for the cockpit. In the fall of 2013 we removed the rudder and elevators. The beautifully restored interior of “Lacey Lady’s” nose in the museum hangar. We plan on bringing the Lacey Lady down off the pole this spring. Once down it will take about 2 months to get her cleaned, dismantled and transported to our hanger. A lot of people have asked why don’t you just get a crane and bring it down? It is not quite that simple. We have done our homework. Besides hiring a crane company, there is the 2 months of security fence rental so that once the airplane is down people don’t just show up in the middle of the night armed with a battery powered sawzall and help themselves to a piece of the plane as a souvenir. Then you have equipment rental. Transport costs, etc. Add it all up and it gets expensive fast. We are currently launching a fundraising campaign in order to cover these costs so that we may not only get the Lacey Lady out of the elements before there is nothing left to save, but to also continue the restoration. 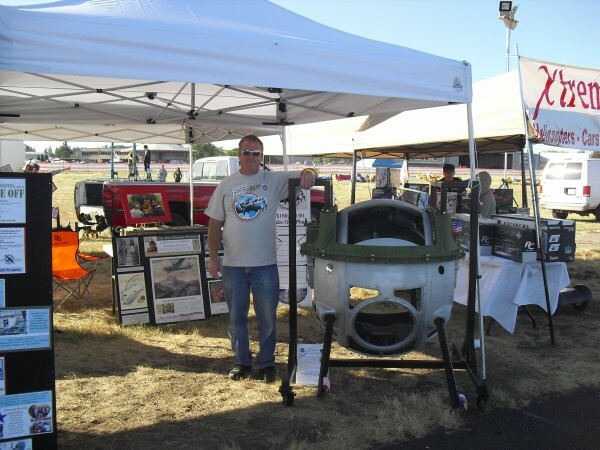 Lacey Lady’s ball turret on display as a traveling exhibit. When not at an airshow, the ball turret is on view at the museum’s hangar at Aurora Airport, in Aurora, Oregon alongside the restored nose section and the other components under restoration. I remember driving past that plane over many years. We always thought it was a really big treat to see it. Me to.. Spent many hours parked under her just getting the “good vibes” I live here in Canby.. Maybe I can help out a little..
Unbelievable! a B-17 that served as an advertisement for decades with only 37 hours on the engines! What a find! wish I was local to help volunteer for the restoration! When will the Lacy fundraiser with flown in war birds occur at Aurora? What components were stolen over the years? I love reading stories like this. It’s great that there are people willing to donate their time and treasure to restore these beautiful airplanes that have seen so much history. Keep up the good work! Every year in early June there is a “WWII Weekend” at the municipal airport in Reading, PA which I have attended multiple times. They usually always have a B-17 (Yankee Lady is the most commonly seen one) and two years ago they had B-29 FiFi fly in. If I should live so long, I’ll be looking for Lacey Lady sometime around 2020.
great to see such dedicated crew to take on this project.this will be no easy task,I live in tasmania,& wish you well,& you will succeed!! I remember buying 100 octane gas at the Bomber Gas station for .37 a gallon for my old 1952 Chev panel back in the early 70s. It was a waste of money for the truck but it was cool to be able to do it.